Q: We have noted that on November 27, nine international experts and scholars published an article titled "Buenos Aires Summit Is a Good Place to Start Fighting Back Against Destructive Unilateralism" in the Financial Times, hoping that the upcoming G20 summit will achieve positive practical outcomes. The article specifically mentioned a piece by China's G20 Sherpa and Assistant Foreign Minister Zhang Jun published on the same newspaper on November 26 which calls for resisting trade protectionism and upholding multilateral trading system. As the G20 summit approaches, what is your expectation for this meeting? A: We have seen relevant articles and reports. The mechanism of the G20 summit was established against the backdrop of the global financial crisis. During the past ten years, it has made remarkable progress, becoming a universally recognized major platform for international economic cooperation which plays an important role in making top-level planning for global economic governance. Currently, the world economy is faced with downward risk and pressure and impacted by unilateralism and protectionism. China hopes that the mechanism of the G20 summit, on the occasion of its 10th anniversary, will once again demonstrate its leading role as a major forum for international economic cooperation, send out a positive signal of upholding multilateralism, advocating partnership, improving global economic governance, addressing climate change, guiding innovation-driven growth and promoting inclusive development, achieve practical outcomes and inject new impetus for the world economy to embark on a course of robust, sustainable, balanced and inclusive growth. China always sets store by and takes an active part in the G20 cooperation. The Chinese leaders attended all the previous G20 summits and contributed Chinese wisdom and Chinese proposals to improving global economic governance. The G20 Hangzhou summit in 2016 marked a milestone in the history of G20 cooperation. All these fully showcase China's full support to the G20 cooperation and multilateralism. 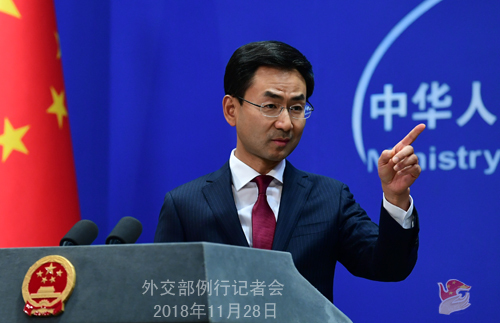 China stands ready to work with all relevant parties to strive for consensus at the upcoming G20 summit and ensure its success, thus enabling it to continue to serve as a major forum for international economic cooperation and make more progress in promoting global growth and enhancing global economic governance. Q: The Meeting of China-DPRK Joint Committee on Border Issues was held in Beijing again after two years. Could you tell us what was talked about at the meeting? A: On November 26 and 27, the Fourth Meeting of China-DPRK Joint Committee on Border Issues was held in Beijing. The chief representatives of the two sides, Chinese Vice Foreign Minister Kong Xuanyou and DPRK Vice Foreign Minister Pak Myong Guk, respectively headed a delegation to the meeting. The two sides exchanged views on the implementation of the Agreement on the China-DPRK Border Management System since the third Meeting of the Joint Committee. Q: A US-based Chinese photographer called Lu Guang has gone missing in Kashgar, Xinjiang according to his wife. Do you have any information on what might happen to him? A: I'm not aware of the case you mentioned. Q: The Spanish government said that it would not sign the Memorandum of Understanding on the Belt and Road Initiative. Do you have any comment on this? A: China and Spain are comprehensive strategic partners, who have prominent complementary strengths in building the Belt and Road and have already achieved some early harvests. If my memory serves me right, former Spanish Prime Minister Mariano Rajoy Brey attended the Belt and Road Forum for International Cooperation in China in 2017. President Xi Jinping is now on a state visit to Spain. 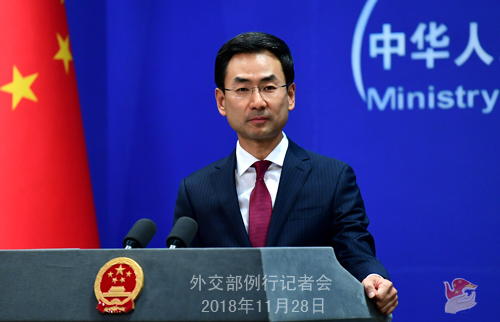 China is willing to take this visit as an opportunity to strengthen the synergy of development strategies with Spain, further tap into the potential for cooperation, elevate and upgrade the practical cooperation to make greater contributions to promoting Eurasia connectivity. Q: The New Zealand government has declined to allow a New Zealand telecom firm to use Huawei to provide 5G services citing a risk to national security. Are you aware of the situation? Have you discussed it with New Zealand? A: We are gravely concerned about relevant reports. The Chinese government encourages Chinese companies to conduct economic cooperation in other countries on the basis of following market principles and international rules and abiding by local laws. The China-New Zealand economic and trade cooperation is mutually beneficial in nature. We hope that New Zealand can level the playing field for Chinese enterprises' operation there and contribute more to mutual trust and cooperation. 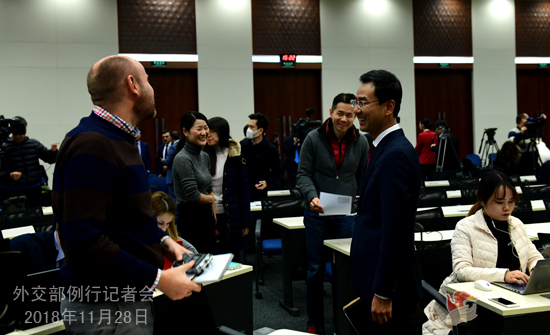 Q: Does the Chinese government have any plan to prevent scientific research on human gene editing in the future? A: A journalist raised a similar question yesterday. Like I already said, this is not a diplomatic question. In addition, China's National Health Commission, Ministry of Science and Technology and other relevant associations and Chinese experts and scholars have expressed their opinions on this issue. I believe you may have noted that.